Over the years, pipe couplings have helped provide innovative and cost-effective solutions to a number of diverse challenges in industry, shipbuilding, water and waste water management and infrastructure. We know you like Gibaults, and they certainly do the job (and have done for well over a century…). But my, what a lot of bolts they need for all that brute strength! In most cases, pipe couplings only have 2 bolts, so each coupling at each joint can save time versus Gibaults or other older pipe joining techniques in the construction phase of new pipelines, plant and installations. They are also mostly a one-person-job requiring no heavy equipment. And who doesn’t need to save time and costs these days? Pipe couplings are also very forgiving (though, of course, maximum tolerances apply). 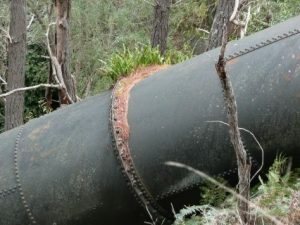 In the real world, deformation and damage can occur to existing and new pipes and connections even on installation of a new facility. These can make repairs and replacement of joints and pipe sections extremely challenging and/or expensive using traditional techniques. Pipe couplings can offer a solution, thanks to their clever design, flexibility, and easy use and installation. Where weather, corrosion, usage and age have affected the original pipeline joints in a plant, pipe couplings make it easy to renew and modernise. They are compact, lightweight and easy to carry – even to awkward existing joints and tight locations. In addition, the equipment required is no more complex or heavy than an Allen head socket and a torque wrench. Anyone who has been inside the engine room of a ship knows only too well how much space is at a premium (and we think the new apartments in Melbourne are small!). Pipes criss-cross each other, and run in front, behind, over and under – sometimes even through – each other. Forget alphabet soup – this looks like a plate of geometric spaghetti. No wonder so many shipbuilders and drilling platforms use pipe couplings. Pipe couplings can be used almost anywhere where there is a pipe or pipes to connect. They can be used to connect metal to metal pipes, metal to plastic, and plastic to plastic. They can be used on PE, PVC and GRP, or concrete and even rubber-lined pipes. Grip-type couplings provide axial restraint, and compensate misalignment and angular deflection (or, to use a technical term favoured by some staff here at KCES, wonky pipes). Flex-type are not axial restraint, but otherwise can do all this and more (BYO steak-knives…) and, in addition, cope with vibrations such as from a pump, or the expansion and contraction caused by temperature changes. As you know, in some parts of this beautiful country of ours, our diurnal range could easily be from +35°C or more, down to -5°C. An example of this might be Mr C.Y. O’Connor’s Golden Pipeline that stretches 600km across the Western Australian Outback bringing water from the Perth Hills to the parched towns of the Gold Fields, such as Kalgoorlie. One drop can take up to 11 days to get from the source weir to your tap at the end of the pipe! See https://www.watercorporation.com.au/home/education/students/the-golden-pipeline for more gob-smacking stats from our friends at Water Corp in WA.